Like many people, I consider my skin an absolute pest when it comes to getting it to look its best. For years it was dry with a tendency towards sudden, inexplicable spots – sometimes even the skin around my spots would be flakey and dry. How on earth one is supposed to deal with that I have no idea, so mostly I just went with it and covered it up as best I could. This of course left me with loads of scars. Then after a while my skin started to get oily all over, which presented a whole other mess of problems I had no idea how to deal with. Fun, right?! I decided I had sensitive, combination skin, and started looking into how to deal with…that. 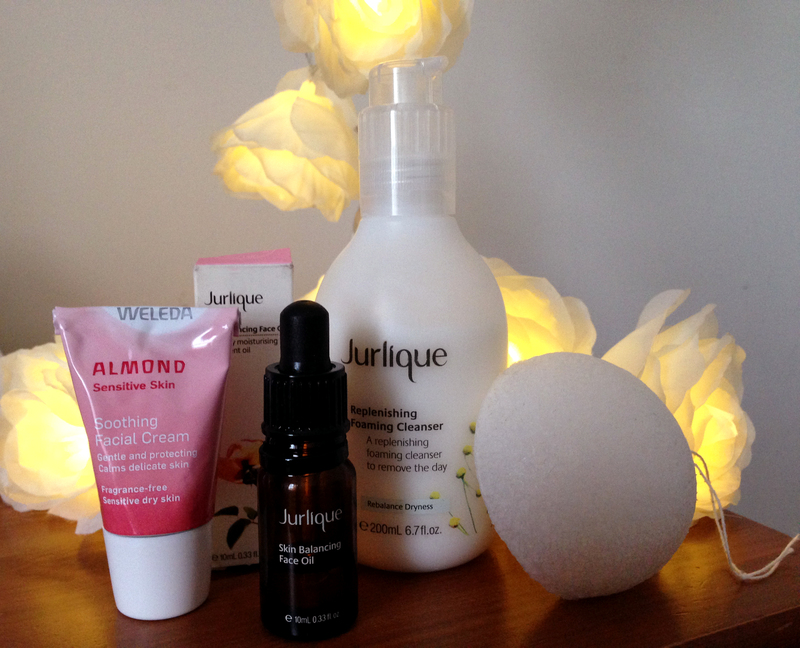 These are the products I now use on my skin. And when I say they’ve transformed my skin’s condition, I am definitely not exaggerating. I think this collection is almost perfectly balanced – cleansing and exfoliating, yet calming and gentle. Originally I didn’t use a moisturiser because of the oiliness, but I’ll explain why I started needing one in a minute. So first of all, my cleansing routine. The sensitivity of my skin means that oily-skin cleansers and abrasive scrubs send it crazy – I don’t like scrubs anyway because the exfoliating granules are rarely biodegradable, which is starting to cause problems with water pollution. But I still need to get rid of dead skin, and that’s where this wonderful combination comes in. Jurlique Replenishing Cleanser is supposed to be for dry skin, but the ingredients really spoke to me. Macadamia nut and avocado oil are both nourishing yet light, easily absorbed oils, perfect for combination skin. Mallow extract protects sensitive skin, allowing it to re-balance, calm and strengthen itself. Calendula does a similar job, helping to reduce inflammation and heal almost every skin problem known to humankind. Used with my amazing Konjac Sponge, it deeply cleanses my skin leaving it gently exfoliated and really smooth. This Balancing Facial Oil was a free gift with my Replenishing Cleanser, and I am so glad I got it. I often don’t bother with free cosmetic gifts because my skin is such a diva, but reading about this one I thought it could be just what I needed, and surprise surprise, it was! It’s an amazing combination of powerful plants, including jojoba oil, Shea butter, rose extract, macadamia oil, evening primrose oil and daisy extract. There’s mallow extract in there to protect, chamomile to sooth the skin, viola pansy to smooth dryness, echinacea to purify and calendula again to promote healing. You can really see how this thing balances the skin, with a formula rich in both purifying and nourishing ingredients. My combination, out of control skin drank it up, and I noticed that something very interesting began to happen to it. Remember when I said that I used to have dry patches? Early on when I started using this product, the oiliness went away, and that dryness came back, without the spots. It was like my skin was shedding its problems and going back to its natural state – literally, going back into balance! Of course, this meant that I needed a moisturizer again, which I’m not complaining about because of all the skin problems in the world, dryness is definitely the easiest to deal with. 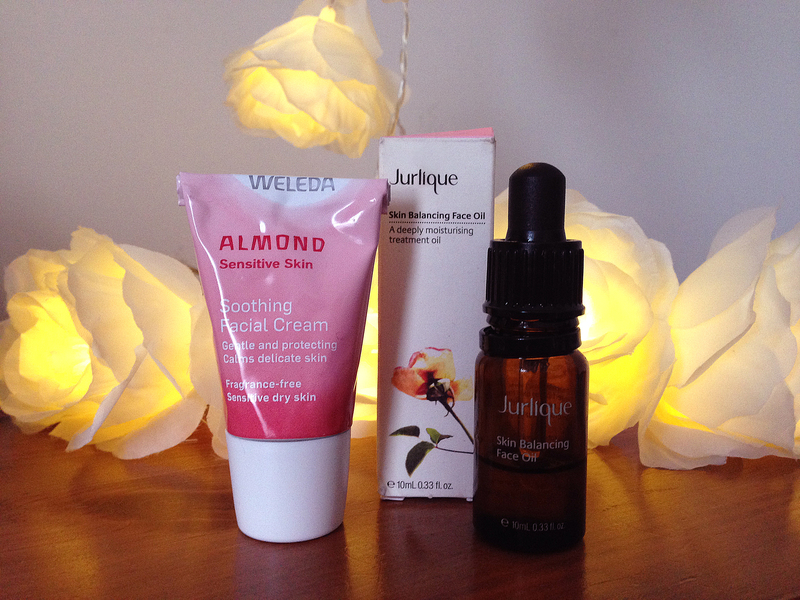 I decided to go with Weleda Almond Soothing Cream because the two Jurlique products I use have LOADS of ingredients, and this cream has nine, and is basically just water and almond oil with binders. Couldn’t be purer. I have to be careful not to use too much, as its very nourishing and rich, but its lovely to use something on my skin knowing that I definitely won’t react to it. So there you have it! If you have unhappy, sensitive, combination skin I would really recommend this routine…but I would also suggest you have a good think about what your skin needs, and what it’s real problems are. Don’t pay any attention to marketing – if I had I wouldn’t have bought a cleanser for dry skin – pay attention to ingredients, and their properties. P.S. 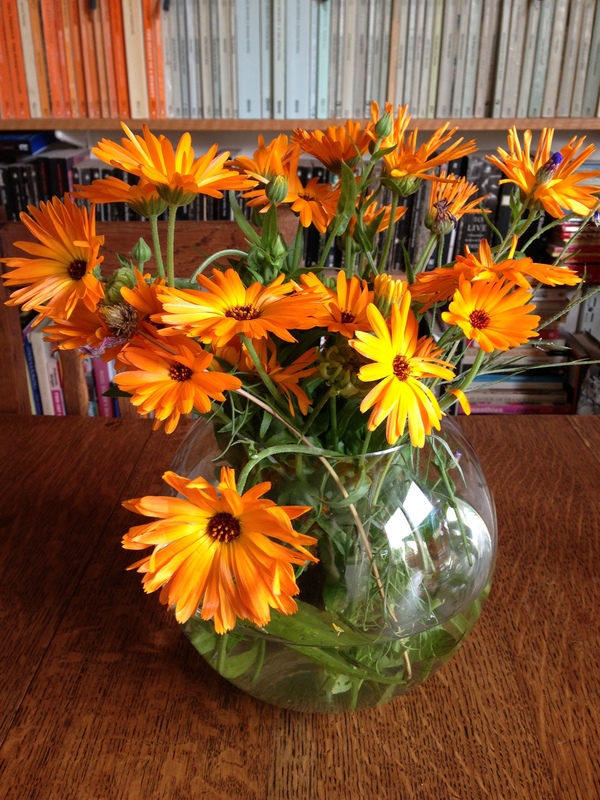 I decided that calendula was definitely the star of this blog post, so there’s a beautiful bunch I picked this summer. This entry was posted in Combination skin, Natural skincare, Sensitive skin, Skincare and tagged Combination skin, Natural skincare, Sensitive skin, skin problems, Skincare. Bookmark the permalink. I think you’ve hit the nail on the head. Finding the right products for your own skin is essential. What may suit someone else may not suit you. I’ve got incredibly sensitive skin as well and I have lost count over all the different creams and brand that I’ve tried. The only brand that seems to go well with my skin is Nivea. Everything else either dries out my skin or gives my a terrible breakout. Ooh yes you must try out the konjac sponge, it is absolutely amazing!